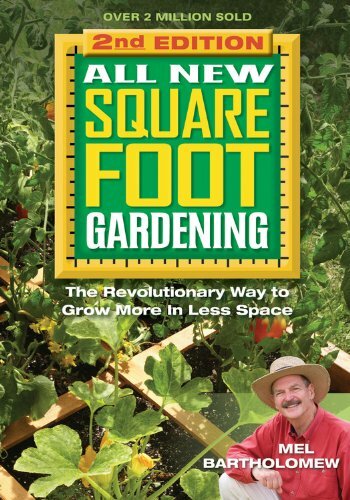 No power equipment is needed for Square Foot Gardening. Instead of using one’s own poor soil, use a combination of peat moss, vermiculite and compost. Build up (add a box) instead of digging down when growing plants with deep roots. Successive plantings require only a small scoop of compost placed where plants have been harvested. The only gardening tool needed is a hand trowel. To save space, grow vertically by putting a trellis on the north side of the bed. Extend the growing season by using plastic sheeting over PVC pipe or electrical conduit hoops. Lowes has a 4×4 version for $44.98. Or construct your own from new or scrap wood (not treated wood), or from masonry blocks. Compared to a row garden, Mel claims his method uses 20% of the space, 10% of the water, 5% of the seeds and 2% of the work. The initial material expense is offset by very little cost in subsequent years, when all that is needed is a little homemade compost in each square.